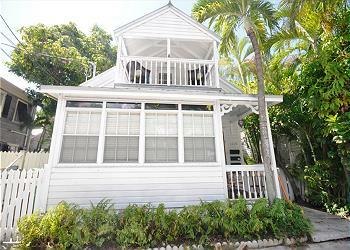 Our historic Key West vacation rentals are located in the heart of Old Town Key West. Key West is famous for its historic charm and old town center. Duval street, which runs through the center of Old Town Key West, has beautiful, historic architecture with classic Victorian homes and cottages. Throughout Key West, you’ll discover many museums and other relics from its famous past. Every home has its own distinct architecture and rich history. Staying in Key West’s historic district gives you a close glimpse into the past of this special island. 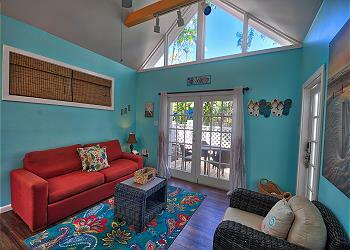 Book a Historic Vacation Rental in Old Town Key West! Located in The Colony, a secluded compound just steps from Duval Street, Colony Sunset is a colorful and relaxing retreat. Walk up the flagstone path and enter the home through the vivid and cheerful living space, accented with cerulean blue walls and splashes of tropical art. 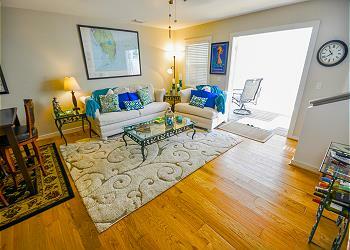 28 Day Minimum Rental: Duval Square Delight is located in a quaint town home community just steps from Duval Street. Upstairs there are residential units and a rooftop pool, while downstairs there are shops and restaurants surrounded by cobblestones and mature, tropical landscaping. Located in the heart of Old Town, Duval Square is a charming brick-paved and tree-lined courtyard complex located at the quieter end of Duval Street. The residential units are located upstairs, while quaint shops and restaurants occupy the courtyard below. 28 Day Minimum Rental: This comfortable and fresh two bedroom, one bathroom apartment is located in the heart of Old Town Key West. Havana Lane recalls a time in Key West's colorful history when cigar makers populated the neighborhood, gathering on their porch stoops to cool off and socialize with friends. These twin homes have the charming original style of the Key West "shot gun" cottages and have been restored with a beautiful natural cypress exterior. Each cottage opens to it's own semi-private deck and lounge area with access to a large free-form pool with waterfall. Open the door to this brand new home in the very center of Old Town Key West, and begin your perfect extended-stay getaway. In the heart of old town Key West, nestled within the secluded and lush community of private homes and condominiums of Truman Annex, this Shipyard Condominium has convenient access to both the gorgeous Fort Zachary State Park Beach and historic old town Key West.